The new government is ‘alert’ about the possibility of a below-normal monsoon this year and is preparing contingency plans, President Pranab Mukherjee said on Monday. With 60 per cent of farm land being rainfed, he said the government will ‘complete the long-pending irrigation projects on priority and launch the ‘Pradhan Mantri Krishi Sinchayee Yojana’ with the motto of Har Khet Ko Paani. The Indian Meteorological Department has forecast a below-normal monsoon this year because of the El-Nino effect. 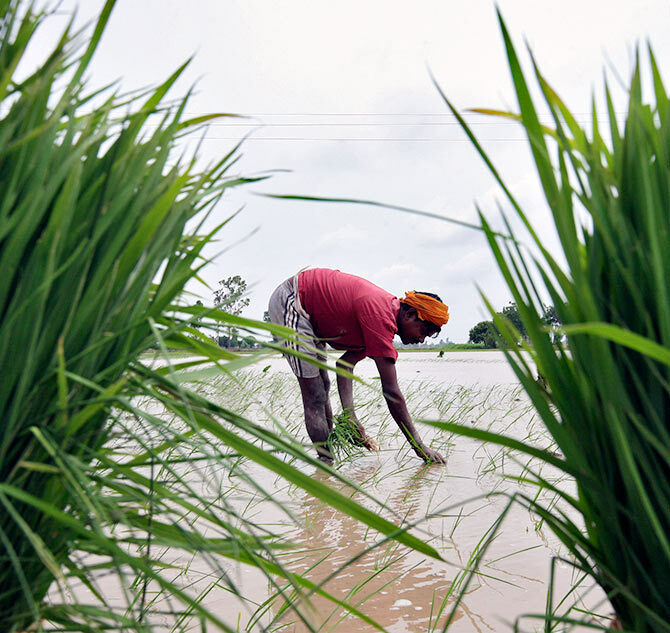 Image: A farmer plants rice saplings in a paddy field against the backdrop of pre-monsoon clouds in Amritsar. Addressing the first joint sitting of Parliament after the general elections, Mukherjee said: "My government is alert about the possibility of a subnormal monsoon this year and contingency plans are being prepared." The monsoon hit Kerala on June 6 after a delay of more than a week. The IMD will today release its second forecast on the monsoon's progress in other parts of the country. Committed to giving high priority to water security, Mukherjee said: "There is a need for seriously considering all options, including linking of rivers, where feasible, for ensuring optimal use of our water resources to prevent the recurrence of floods and drought." 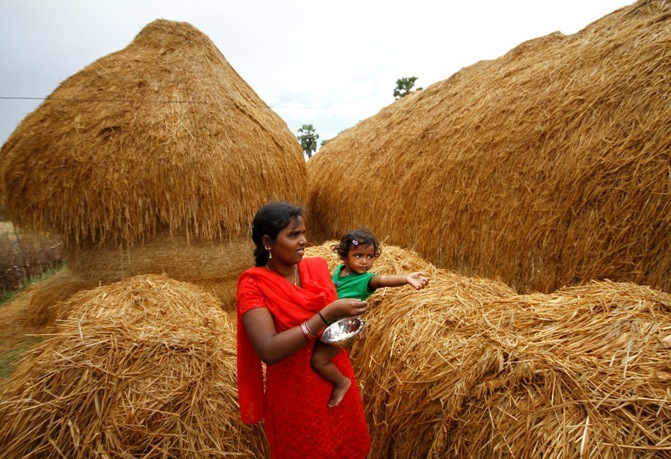 Image: A woman feeds her child next to a stack of dry paddy at Nellore district in Andhra Pradesh. The government will nurture water conservation and ground water recharge by harnessing rain water through ‘Jal Sanchay’ and ‘Jal Sinchan'. Micro irrigation will be popularised to ensure ‘per drop-more crop'. Expressing concern over farmer suicides, Mukherjee said: "Agriculture is the source of livelihood for majority of our people. “In the recent past, our farmers have been under severe stress with hopelessness driving some of them to suicide. “My government is committed to reversing this unfortunate trend," he said. The government will increase investment in agriculture, both public and private, especially in agri-infrastructure. 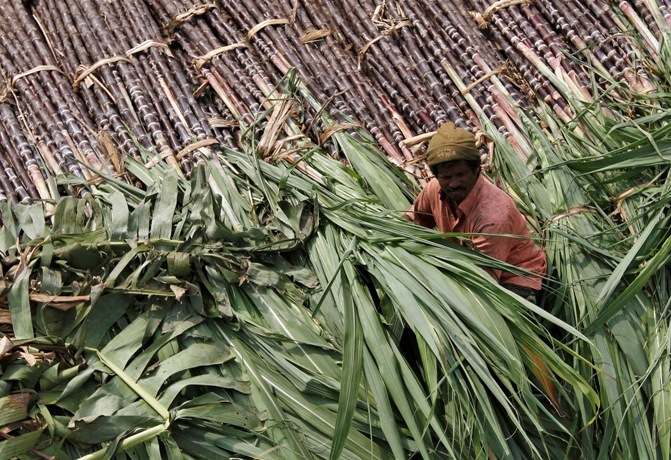 Image: A trader sits on a pile of sugarcane as he waits for customers at a wholesale market in Chennai. Steps will also be taken to convert farming into a profitable venture through scientific practices and agro-technology, he said. The government will also adopt a 'National Land Use Policy' to facilitate scientific identification of non-cultivable land and its strategic development, he added. In the next five years, the President said, the government will address issues pertaining to pricing and procurement of agricultural produce, crop insurance and post-harvest management. It will offer incentives for setting up food-processing industries. Existing cooperative sector laws will be reviewed to remove anomalies and lacunae, he added. 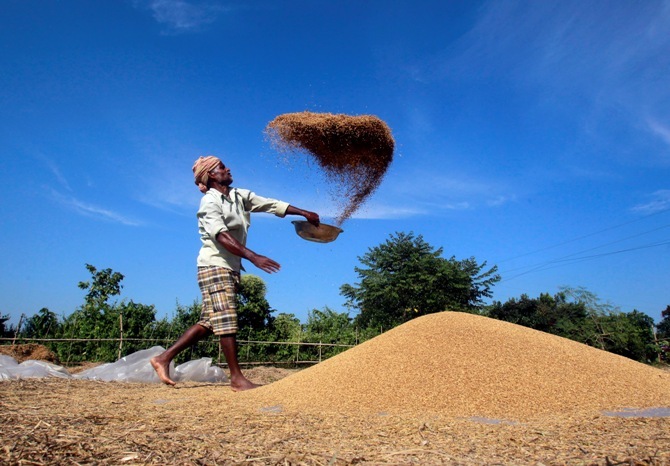 Image: A farmer winnows paddy crops at a field. Why is good monsoon so important for the economy?